Enjoy your last few minutes of glory, pool cover. Pool season is just about here. Well, Opening Day for the O’s has come and gone, and despite a hot start, things have now cooled off for the Birds of Baltimore. But speaking of opening day, hot days, and cooling off — let’s talk about pool season. If they haven’t already done so, pool owners across Maryland will be opening up their pools in coming weeks, eager to dive in. Here are some tips to make sure opening your residential pool goes as smoothly as possible. After a long winter’s nap underneath a pool cover, your pool is ready to greet the warm spring air. 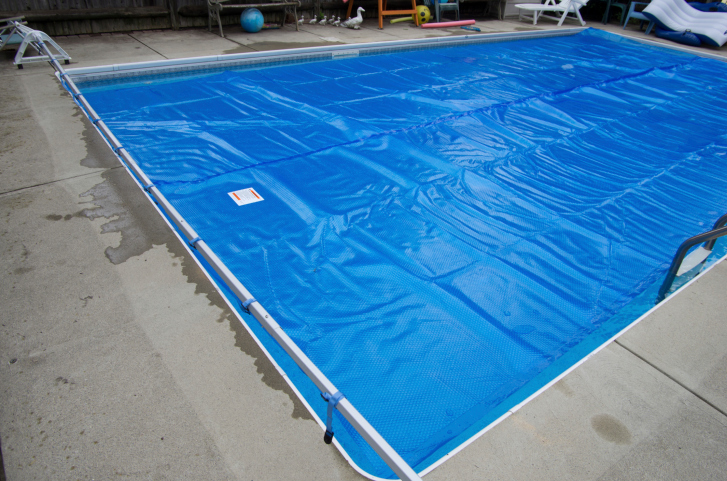 Whether you have an automatic pool cover or a standard one, you should start by clearing it of any dirt, debris, and early springtime pollen that may be coating it. You don’t want all that junk falling into your pool, do you? Rinsing it with a hose will be quick and efficient — just make sure it has a chance to dry off in the sun before it goes away into storage, because lingering moisture can be a hotbed for mold and mildew growth. Before opening your residential pool, make sure you have all the necessary equipment to fully enjoy pool season. This can mean a whole lot, including but not limited to: pool chemicals, cleaning supplies, properly functioning pumps and filters, pool toys for your own enjoyment or that of any kiddies that may be joining you, and maybe more. How about adding some more outdoor living features? Need any post-winter renovations before opening up shop? That’s something we can definitely help out with. Those are also important factors to take a peek at before opening your pool. It might not be the most fun task, but it will be so worth it when your paradise is shining bright after everything’s said and done. Get down and dirty with some spring cleaning elbow grease to make sure your pool is in good shape for opening day, and then check out what we have to offer in the way of pool cleaning systems to make sure it stays that way throughout the summer. And as always, if you have any questions about any aspect of preparing for opening your residential pool, never hesitate to shoot us an email or give us a ring. We’re always happy to help you get the most from your backyard paradise. This entry was posted on Wednesday, April 27th, 2016 at 4:29 pm. Both comments and pings are currently closed.